KNEE ARTHRITIS | GEORGE D. GOUDELIS MD. Ph.D. The knee is created by the femur, the tibia and patella. The end surfaces of these bones are covered by articular cartilage that can move one bone relative to another, minimizing friction. The patella is a bone that is moving in the anterior knee, and over it passes the tendon of the quadriceps muscle and the combination of the patella tendon and creates extensive mechanism of the joint. The knee is divided on the lateral, the medial and anterior compartment. The lateral compartment consists of the lateral femoral condyle and lateral tibial plateau , the medial compartment of the medial femoral condyle and tibial plateau in through the front end and consists of the patella and femoral trochlea. 2. Rheumatoid arthritis. 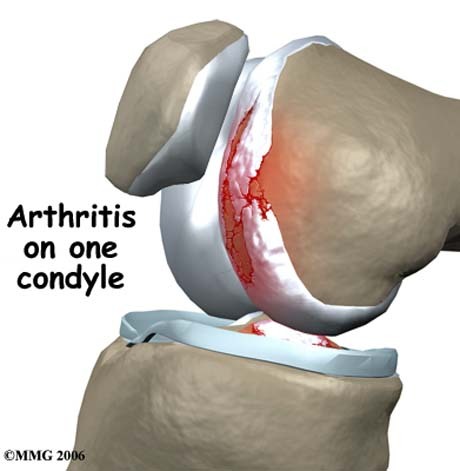 An inflammatory type of arthritis which destroys the articular cartilage and may occur at any age. 3. Traumatic arthritis. usually occurs after injury to the joint. This type of arthritis is like osteoarthritis and may develop after long periods of a fracture, damage link or tear of the meniscus that was not treated promptly. Knee joint with severe degenerative artrhitis. 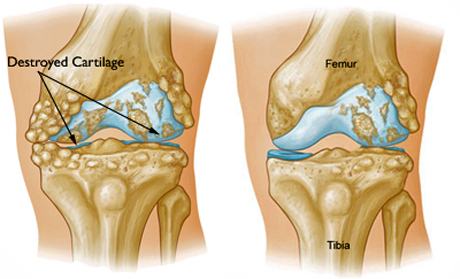 The articular cartilage is damaged. The pain due to arthritis has been a gradual evolution but the sudden emergence of severe pain may also occur. Usually the symptoms begin with pain after fatigue as the disease progresses and appears calm. The night pain usually means end stage osteoarthritis and surgery is now the only solution. The affected joint may develop edema (swelling), become stiff, difficult to display in normal flow and range of motion (loss of the last degrees of flexion or extension). The pain may be the reason why the patient feels weakness in the leg in the early stages. During disease progression by reducing the individual function of the affected joints leads inevitably to the development of muscle atrophy of quadriceps and hamstring muscles having longer objective the reduction of muscle force and occurrence of weakness of the leg. The Orthopaedics Surgeon specialist will examine the knee to determine whether it shows signs of inflammation such as severe edema (swelling), redness and increased local temperature. Then we will carefully evaluate the scope and quality of motion of joints, it now points to palpation sensitivity occurs if there is fluid in it, we noticed any distortion, the way the patient walks though shows some form of lameness or inability to perform motions. The simple X-ray control shows mainly the reduction of joint space, signifying the loss of articular cartilage and generated spurs. It can also be evaluated and the disturbance of the mechanical axis of the leg. X-Ray: knee joint with severe degenerative osteoarthritis. There is no cartilage among the bones due to degeneration and this condition produce severe pain. The CT scanogram is the ideal tool for evaluation of anatomical and mechanical axes of the lower extremities, ie the evaluation of the percentage of the derogation and the deformation of the joint than normal. 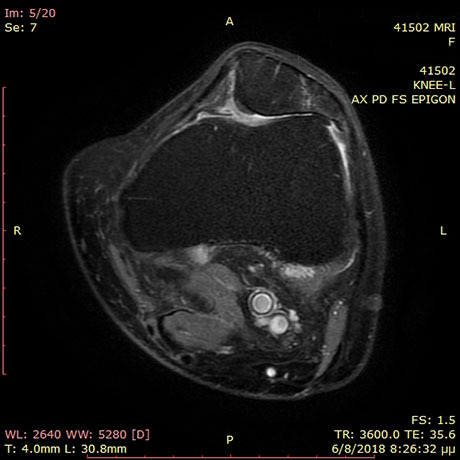 CT scanogram: evaluation of mechanical and anatomical axes of the legs to precisely determine the deformation thereof. Magnetic resonance imaging helps the physician to a more detailed assessment of the problem by checking the status of articular cartilage, meniscus and ligaments, which will determine the topography of arthritis and the type of treatment to be followed. MRI Knee joint. Severe degenerative osteoarthritis. Specific blood tests will help in the diagnostic process of reasoning of arthritis (rheumatoid arthritis, gout, etc). The conservative treatment includes a wide range of therapeutic agents that their effectiveness varies from person to person. The choice of an appropriate regimen should be tailored individually for each patient depending on the nature and severity of his problem. The goal of treatment is to reduce pain, increase of joint function and the possible slowing the progression of wear. These lifestyle changes include the patient's body weight loss, cessation of aggravating activities like running and start swimming and cycling and generally avoiding activities that demonstrably affect the condition of joints. Many patients with osteoarthritis have more pounds which certainly exacerbate the symptoms and disease progression. The loss would provide relief by upgrading the quality of life and prolonging the viability of the joints unencumbered. The exercises and physiotherapy improve range of motion and flexibility of joints affected, and strengthen the muscles of the legs. The program of physiotherapy should be created in collaboration with the Orthopaedic Physiotherapist and adapted to the needs of each individual patient. The use of supporting instruments such as walking stick or crutches vent joints affected over a specified period to remedy the acute phase of disease with pronounced symptoms. 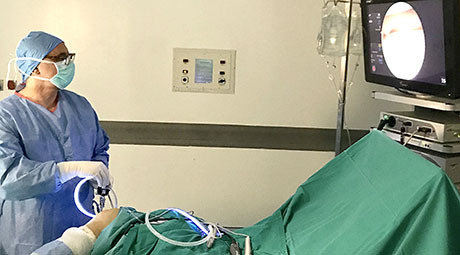 The special walking test (electronically), and manufacture of special cleats, personalized for each patient, often offer a palliative solution to the patient's symptoms after balancing the loads exerted on the knee. Generated in this way even distribution of forces due to the correction of mechanical axis of the joint. The process of feet test is simple, painless and performed in a specialized clinic. The special soles that will be constructed from the data review, we will adjust the patient in his shoes easily. These splints prevent discharge of joint load on the overburdened point of articulation (eg arthritis medial compartment), while the splint support support across the joint by improving the stability and functionality of this. 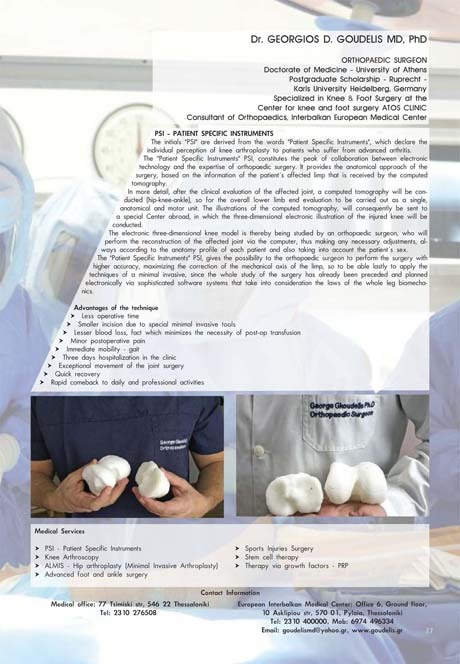 The suitability of the prosthesis for each patient will be judged by the treating Orthopaedic. 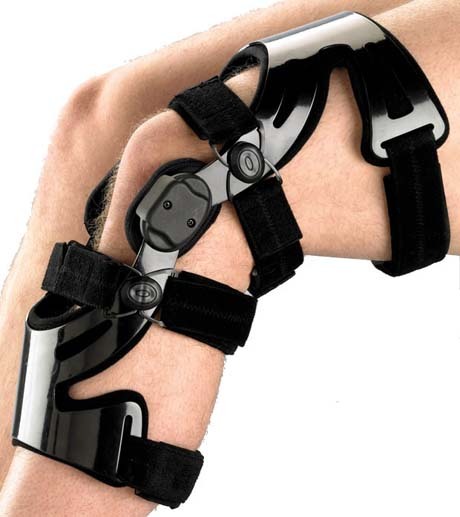 Functional braces for protection and relief of symptoms of the affected knee. In recent years the emergence of glucosamine sulfate, chondroitin and Hyaluronic acid, was the new treatment of osteoarthritis and can relieve the symptoms such as pain, stiffness without the side effects of anti-inflammatory drugs. Are two large molecules normally present in articular cartilage and are essentially food supplements, not drugs. To achieve the utility of treatment should be taking them every day for long periods if they do not appear natural effects such as nausea, vomiting, allergic skin rash etc. Today is the drug of choice in many countries worldwide. The corticosteroids are a powerful anti-inflammatory agent and can be infused into the inflamed joint. Benefit is usually in the acute phase of disease in patients with moderate to severe pain, but his offer in advanced stages of disease is minimal. The duration of action of the drug varies depending on the makeup of the organism and stage of disease. Three injections per year are the maximum annual dose of the drug. The intrarticular injections of hyaluronic acid bring relief of symptoms of arthritis in a large percentage of patients who do not belong in the category of anti-inflammatory drugs or corticosteroids. The drug is a natural derivative of articulation and has strong lubricating properties that help improve mobility of the patient. Injections are made ​​once a week for five weeks, twice a year. It is considered that assist in increasing production of hyaluronic acid from the same joint. The therapeutic effect of intrarticular injections can last for many months. The most modern and promising method today is the Autologous Conditioned Plasma. Autologous blood products have created a growing interest for use in a number of orthopaedic therapies. The healing effects of plasma are supported by growing factors released by platelets. These growth factorsmay induce the healing response. The early clinical results are very good and promising. The surgical treatment is the solution in cases where conservative therapy has not yielded the expected results. 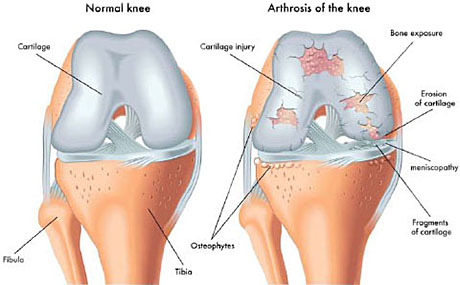 Severe knee osteoarthritis bilaterally. Varus knee. X-ray of the previous patient, male 72 years old. The arthroscopy is the most advanced orthopedic surgical method in the world, which allows qualified Orthopaedic surgeon to diagnose and intervene therapeutically by using surgical instruments in size of a pencil being introduced into the joint by two holes on the front - the side surface of the knee. The arthroscope contains optical fibers that transmit the image taken from inside the knee with an external editor to view a monitor (TV). From the image displayed on the monitor, the Orthopaedic Surgeon examine carefully and in great detail the inside of the knee and decide on the nature of the problem and treat it. During arthroscopy, the doctor can insert special surgical tools from the second hole by acting thus diagnostic and therapeutic. With tools smooths the damaged articular cartilage remove free particles (parts of cartilage or meniscus), 'washing' the joint by removing the molecules that cause inflammation. If it ruptured the meniscus or link to a simultaneous repair of these. Early arthroscopy of the knee may delay the progression of osteoarthritis, and hence the need for more major surgery such as arthroplasty. Sometimes osteoarthritis occurs in a single partition of the joint, the medial, the lateral or anterior without serious damage to the other two apartments. The osteotomy is one of the solutions to tackle this problem. The disturbance of the mechanical axis of the leg (Varus or valgus knee-wrong feet), ie the loss of proper alignment thereof, which may either be due to the special construction of the legs of the person or other reasons, the main cause of uneven wear of the joint. Radiographic osteoarthritis of the valgus knee. Deformation of the mechanical axis of the leg. The osteotomy is suitable for ages under 60 and active people. The orthopaedist will assess the charge distribution in the joint and surgically created a new order in minimize the forces essentially the area with the greatest damage by shifting forces to healthier areas of the knee. 2. varus osteotomy of the distal part of the thigh bone. 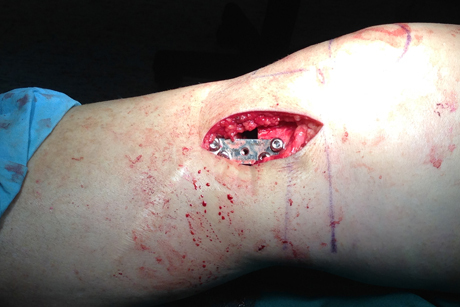 Valgus tibial osteotomy X-ray with special plate and screws. Post op results. Full correction of the mechanical axis of the leg. The charge distribution in the joint is balanced. The patient entered the clinic the day of surgery without having eaten or drunk anything. The duration of surgery is approximately one hour and is performed under general or spinal anesthesia. Postoperatively time special splint on the lower limb and gait done with the help of crutches (crutches) for 6 to 8 weeks. The patient remains in hospital for two days to take full nursing and medical care. The return to activity takes about 3 to 4 months. Sometimes osteoarthritis occurs in a single partition of the joint, the medial, the lateral or anterior without serious damage to the other two apartments. Until recently where they were replacing the whole joint and two condyles that is known as total knee arthroplasty, sacrificing in this way the healthy femoral condyle, the meniscus and anterior cruciate ligament. The unicompartmental arthroplasty for the medial compartment or lateral based on the replacement of only one condyle and the corresponding surface of the tibia is affected by osteoarthritis. Implants applied in the affected region provide smooth surfaces that move with ease without causing pain and hence the person undertakes activities that may have been abandoned because of severe symptoms. This is a significant advantage for younger patients who might need in the future a second surgery when the first will show significant wear rate. Removing less bone during the first surgery, makes easier the implementation of the revision total hip replacement using the knee joint at a future time if necessary, of course. The duration of surgery does not usually exceed 90 minutes. The stay in hospital is 2 days to take the patient to appropriate medical and nursing care. The day of surgery the patient can walk with partial weight bearing to operated lower limb with walking assisted device, and begins physical therapy program which will continue at home for a few days. 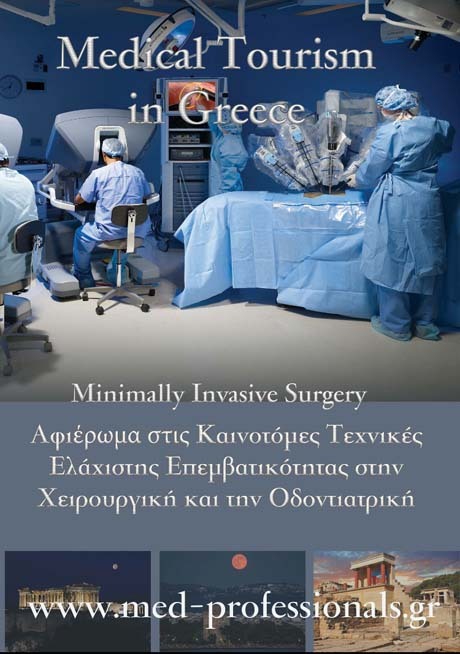 Photographic imaging during the surgical procedure. Preparation of the bone to receive the implant. Photographic imaging during the surgical procedure. Application of the femoral implant arthroplasty. Unicompartmental knee replacement. Final view. One of the major developments in the history of orthopedics is the total replacement of the knee joint with special materials. The first surgery was in 1968 and to date the improvement of surgical techniques and materials constantly upgrades its effectiveness. • Intense pain in the joint that restricts everyday activities like walking, climbing stairs, etc. • Moderate or severe pain during the rest of the day and night. • Distortion of the axis of the knee towards the inside or outside. • Failure of anti-inflammatory drugs to cope with the pain. • Failure to improve symptoms with other therapies like cortisone or endarthrikes injections of hyaluronic acid, physiotherapy and other minor surgery (arthroscopy). The age of most patients undergoing total hip replacement is 60 to 85 years, but the Orthopaedic Surgeon evaluates each an individual patient. Recommendations for surgery based on clinical symptoms of the person and not his age. The surgery is now done with great success in all age groups from teen with rheumatoid arthritis by older people with degenerative osteoarthritis. • Medical history concerning general health of the patient, the disease suffering, medications taken and any preceding surgery. Upon receiving information relating to the affected joint. • The clinical examination in assessing the range of motion of knee pain, instability that may exist, the muscle strength around the knee and the mechanical axis of the limb. All the test results will be evaluated carefully by the Orthopaedic Surgeon and the decision for the surgery will be discussed with the patient. The introduction of patient on clinic is one day before surgery. Upon introduction, the necessary tests. hematological, cardiology and x-rays will accompany the preoperative control. The visit of the special anesthetist will establish the type of anesthesia that will take the patient (general or spinal) always according to medical evidence and the patient's wishes. The patient and his relatives must provide two units of blood for transfusion of any during the operation. The surgery takes about two hours. The Orthopaedic Surgeon will remove the damaged cartilage and replace them with metal art technology, fully compatible with the organization. The new articular surfaces of joints to ensure painless and unrestricted movement for many years. After surgery the patient is transferred to the recovery room for about 20 minutes and taken to his room near his own people. Bearing autologous transfusion system (system re the lost blood in the body of the patient with the system of recycling) to reduce so far as possible the chance of taking another blood. The stay in the clinic ranges from 5-14 days to receive full medical and nursing care. Physical therapy starts in bed the next day and the second postoperative day starts walking with partial charge to assist with trapezoidal bacteria (walker). The sooner the patient is mobilized the better the results and benefits of surgery. The daily changes in the surgical wound made by the Orthopaedic surgeon who monitor the healing progress and determine the treatment plan. The patient is discharged and transferred to his home. You will receive anticoagulation for 20 days for the protection from thromboembolic disease. Physical therapy will continue for the next few days to restore a satisfactory range of motion of the knee and a large percentage of muscle power. The stitches are removed around the 15th postoperative day. Mobility of the knee joint after 20 days from surgery total joint replacement. The result is from the same patient as excellent. • Keep the incision area clean and dry. Changing bandages placed on the day of your departure from the hospital must comply with the instructions of the attending orthopedic surgeon. • Do not soak in the operated knee until you remove the stitches. These are usually removed 12-15 days after the day of surgery. • Tell your doctor if the wound begin to pull fluids. • Measure the temperature of your body twice a day and tell your doctor if it exceeds the 38 º C.
• Edema (swelling) in the operated limb is normal for first 3-6 months. Take the medication as determined by your orthopedic surgeon. For about a month after the surgery should take a daily injection in your abdomen, around the navel, for the prevention of venous thromboembolism. The antibiotics will continue for only a few days after your discharge (pills by mouth). Each time you visit the dentist will highlight that you have total knee arthroplasty for you cover everything with antibiotic treatment. On discharge from the hospital will already eat normally as you eat before surgery. The orthopaedist may recommend you taking iron supplements and vitamin C to help in quicker recovery of your powers and better wound healing. Narrow as possible to take coffee and avoid alcohol completely. It is very important not to gain weight. The emphasis will entrust the resected joint and not only this. On your return home you should stay active. But beware, do not overdo it. As time passes you would find out as to improve the ability to move and increase muscle strength and your endurance. Continue the exercise program for two months after surgery. The stationary bike helps to increase muscle strength and maintain flexibility in the muscles surrounding the knee. If he has replaced his left knee and have a car with automatic transmission can start driving one month after surgery. If the surgery was to avoid right knee to lead the first 3 months. You can sleep safely as you wish, tummy, back or side. Depends on the kind of work practice. It usually takes 3 months to return to work. You can walk as you want to remember, however, that walking is not a substitute for the exercises that your doctor tells you. Swimming is good exercise tool and can be started 6-8 weeks from the day of surgery. Avoid exercises that strain is generally much the resected joint, such as lifting heavier than 15 pounds.